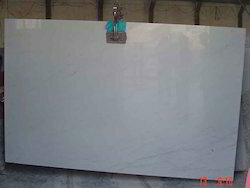 Kandla Gray Sandstone or Bhilwara Gray Sandstone or Silver Sand Sandstone is Gray colored extremely hard sandstone because of the quartz grains being cemented together with silica and calcite. This is hard wearing sandstone. It shares the solid modern feel of bluestone and looks simply stunning laid around a pool. The colors of this sandstone are very consistent however still for very discerning customers it can still be graded in two shades Dark Gray & Light Gray. Kandla grey Sandstone owing to the natural grey shade and because of the inherent properties of sandstone, this stone is extremely popular in the construction of paving, huge landscaping projects, window sills, lintels, kerb etc. Kandla grey Sandstone is also used for wall cladding and in other interior applications. Kandla Gray sandstone is not only durable but is beautiful to watch. One can get this flooring / paving done in their home, on terrace or outside area of the house like gardening area, pathways or pool side. It makes the room look elegant and gives timeless style. This is the reason it is most sought after material when it comes to flooring and paving Kandla Gray Sandstone has the property of being chiseled and dressed into smooth surface or can be carved into various shapes. It is extensively used as roofing and flooring stones, as well as for paving and paneling purposes. It is also used in the form of beams, pillars arches, doors and window sills, wall facings, fence posts and millstone etc. This stone is highly resistant to acids, alkalis and salinity and it provides resistance to thermal variance also and is therefore suitable for construction of building near seashore or as a flooring material and wall facing in chemical industries due to its acid and alkali resistant properties. Kandla Gray Sandstone became popular material due to its durability, strength and beauty. This stone is used as the sole building stone in almost all civil works. Kandla Gray Sandstone is available in various finishes such as natural cleft, flamed, polished, honed, bush hammered, sawn, acid washed, antique finish and sand blasted to suit different applications. The finish and smoothness of tiles and slabs of sandstone depends on the finish of edges, which is available in machine cut, sawn, hand chiseled, hand dressed and chamfered, beveled. We are manufacturer and supplier of walling stone. 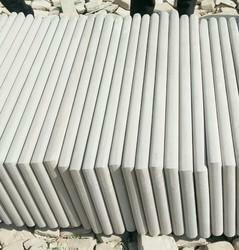 We supplying these walling stone to the exporters and builders to built a non breakable wall for long lasting. We offering a wide range of Kandla Grey Walling Stone with customised sizes. 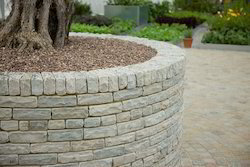 These walling stone can be use in cubic sections as sills,coping water tables and other exterior features.Exterior cladding is also a comman application of walling stone. We are leading manufacturer and supplier of Kandla Grey Sandstone Paving. We offer kandla grey sandstone paving with natural/handcut, machine cut, calibrated and with every finish required by the customers. Application area for Kandla Grey Sandstone paving stone are landscaping projects, pathways, driveways, parking lobby etc. We are leading manufacturer and supplier of Kandla Grey Sandstone Cobbles in India. 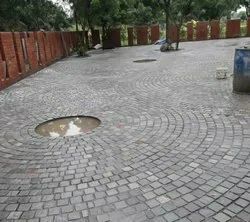 We are manufacturing and supplying the kandla Grey cobbles to many wholesalers and suppliers in India as well as all over the world. Kandla Grey sandstone Cobbles are highly demanded for Pathways, driveways, Roads and in many landscaping projects. 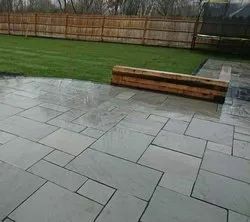 Kandla Grey Sandstone Cobbles are available with different sizes and thickness.Application areas for Kandla Grey Sandstone Cobbles are pathways, driveways, car porch public roads etc. 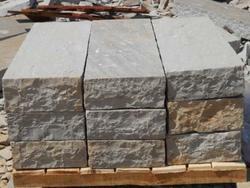 We are manufacturer and supplier of Kandla Grey Sandstone Block Steps from Rajasthan, India. Kandla grey sandstone blocksteps are first choice of every landscaper to make the solid steps in garden. Solid steps are available at very low price to compare with other traders in market. Solid Steps can be use for grden steps, Kerbs, Landscaping etc. 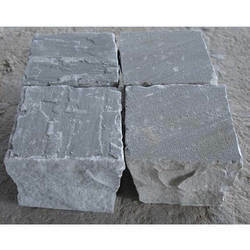 We are leading manufacturer and supplier of Kandla Grey Kerb Stone. Kandla grey kerbstone are available with natural chiseled finish which give very attractive and natural look for any landscaping projects. With years of experience in this domain, we have carved a niche for ourselves, in offering a wide assortment of Grey Sandstone Slab for Kitchen. Used for paving applications, this sandstone slab is manufactured using quality proven raw material and advanced technology in adherence with industry norms. Our provided sandstone slab is provided in diversified designs, specifications and sizes, as per the needs of our clients. 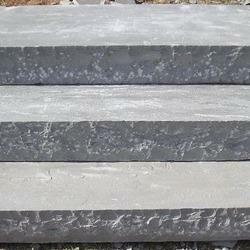 Kandla Grey Sandstone steps are highly demanded by architects and landscapers for indoor and outdoor steps. Kandla Grey Sandstone steps are available with anti slippery surface. We provide shotblast finish with brushing and any other finishes required by customers.